Tomb of Annihilation is an interesting campaign module, not just because of the modern attempt to create a hex crawl adventure but also because of some the tools the adventure contains. One of these tools are the Guides. They are NPCs with well-developed personalities, quirks and secrets, and not just that they are set-up with nice handouts, making them easy to present for the players and keep in mind. The guides may not be a revolutionary thing, but they are still something I have not seen in other hex crawl adventures. Some adventures may suggest hiring a guide and even add a few details, but having a roster and letting the players choose between these set-ups is quite inspiring. For my ToA campaign (which is set in the Mysrara setting) I am planning on running larger expeditions with more henchmen, and thus I wanted to add more NPCs for hire, and they did not all need to be Guides. Some could be experts with valuable skills, and thus I set up a bunch a small selection of Experts for Hire. The Experts of Chult – which now can be found at DM’s Guild. Using henchmen, that are more than anonymous torchbearers and sword caddies, is also an opportunity to add role-playing situations to an otherwise eventless trek through the wilderness. Travelling through the wilderness may present the players with obstacles and challenges, but many are dealing with savage beasts or difficult terrain, but many does not include beings to interact with, and having NPCs jog along means there continuously will be beings to interact with. The experts add skills or bonuses to skills, but getting access to these require interacting with them, and that creates opportunities for role-playing. 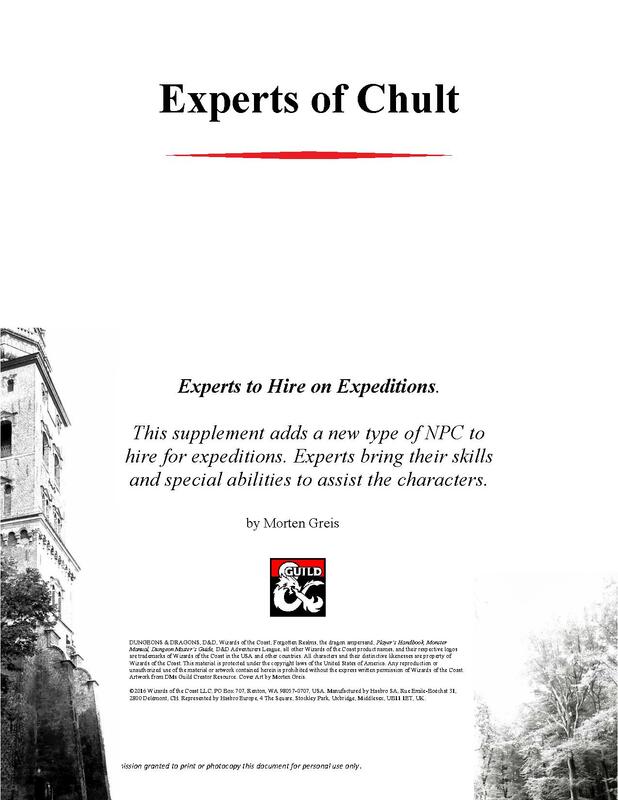 Experts of Chult is the first of my Expedition Crew supplements to Tomb of Annihilation. The next one is Captains of the Coasts of Chult, as seafaring along the coasts will likewise be a part of my campaign.